With more than one-hundred exhibitions to her name, artist Jeanete Musatti displays a selection of sixty works spanning her five-decade trajectory in the untitled show “S/ Título,” curated by Ricardo Resende, at Galeria Bolsa de Arte. Considering she has not shown in her hometown for ten years, it comes as an opportunity to check out the latest production and celebrated trajectory of the São Paulo-born seventy-three-year-old artist of Polish Jewish background born into a family closely associated with Brazilian modern and contemporary art. Roosted in the smallest exhibition room are drawings, sketches and illustrations from 1966 to the 1990s, such as “Desenhos Ritmados” (Rythmic Drawings), a 1982 rigid grid series of finely fabricated repetitive exercises in black and red pens on rice paper (thirty-four-by-fifty centimeters). In the same area, contrasting to the methodical red-and-black graphic artwork, hangs a vast body of free-style drawings in small, variable formats ranging from 1971 to 1991. However, it is the largest exhibition space that concentrates the artistry she is hailed for: her assemblages or caixas (boxes), as she simply calls them. These are small sets, sometimes matchbox sized, built with scavenged material or vintage art-fair collectibles the artist accumulates by the tons in her home-studio. Pegged to the wall like tridimensional paintings or atop pedestals, Musatti’s assemblages display clever situations articulated by her fine irony, elegant fetishism and social commentaries. 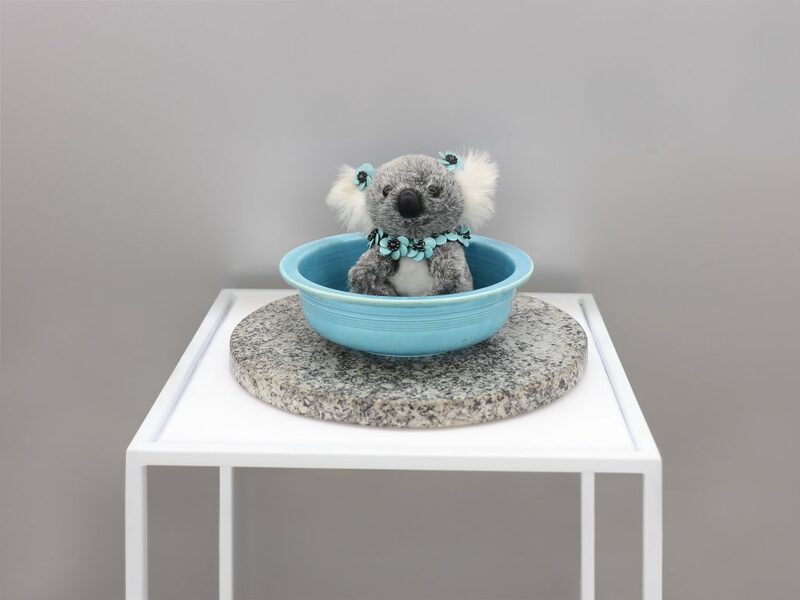 Weaving awareness through inclusiveness and extinction, “Koala Trans” brandishes a grey stuffed koala accessorized in anime-style baby blue sitting on a grey granite slab over a vertical stand. 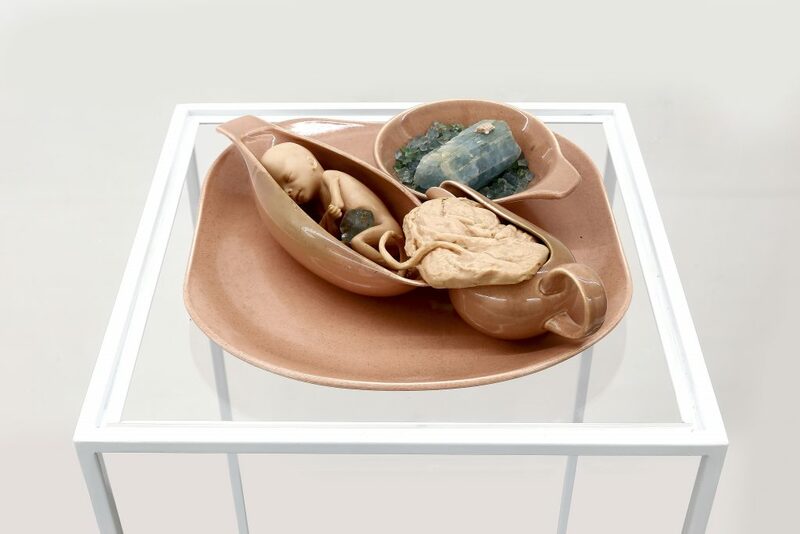 “Nascimento e Longevidade” (Birth and Longevity), on the other hand, earns its weighty title through a plastic fetus nested in a flesh-tinted uterus-like 1950s Russel Wright crockery. “Pantanal” is a series of four tableau-boxes that at first glance seems like a set design in a Wes Anderson stop-motion movie. 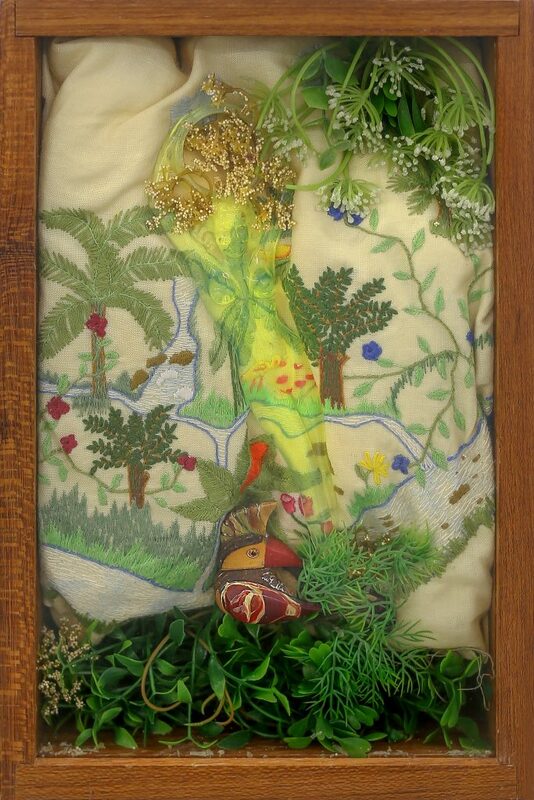 Their vintage plastic toy birds, spiderwebs and kitsch tropical foliage interlace a harsh commentary on man’s harmful actions on the lush landscape of Brazil’s largest wetland with its sui generis native flora and fauna. 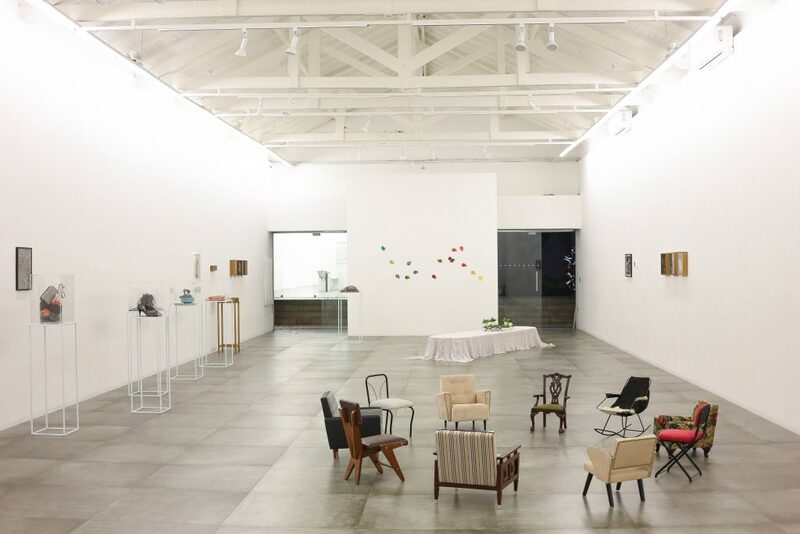 Her sophisticated playfulness is also to be relished at the 2018 installation “Reunião Crítica” (Critical Meeting), a coterie of ten kid-size chairs and seats alluding to a mini-sized Greek agora and also to the scope of the views of today’s world leaders… Another whimsical puzzle is the 2015 sculpture made up of a black broom, bristles and all, “Pensando em Ione Saldanha” (Thinking about Ione Saldanha). 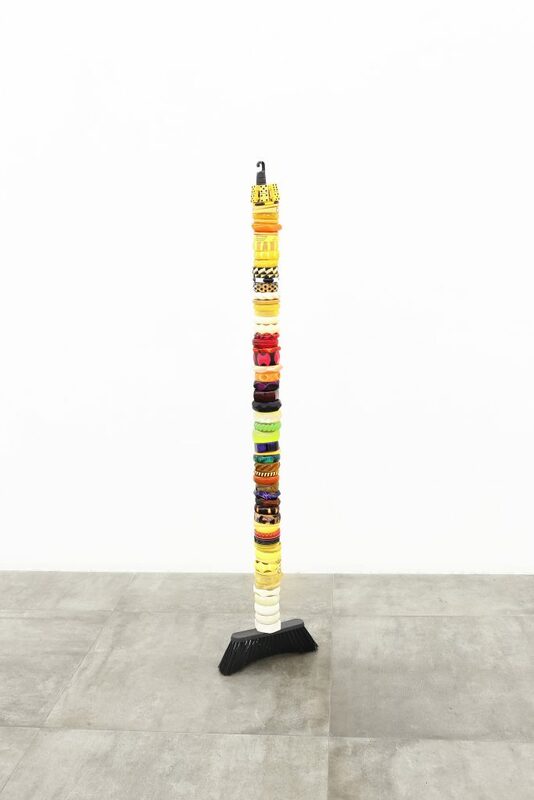 The broomstick is encircled by sixty-two vibrantly colorful bracelets in Galalith and bakelite in a witty nod to the sculptures with horizontally painted stripes on bamboo stalks by another brave woman of Brazilian art, Ione Saldanha (1901-2001). Jeanete, do you see yourself as a dutiful Penelope endlessly working your art? For years I worked the Penelope side of my personality in therapy. I love working long hours at night when silence creeps into my soul. My inner peace comes through my work. I have always had art within me, art complements my relationships. I come from a family of artists. I do not know what is life without art—my parents collected art all their lives and motivated me. Your maiden name, Leirner, is a hallmark in the arts in Brazil. Why didn’t you keep it? When I realized there were too many Leirner artists in a single family—my aunt sculptor Felicia Leirner, my cousin Nelson Leirner, my niece Jac Leirner—I switched to Bruno’s name [her husband] since Musatti has a beautiful Italian sound. Tell us of your formative years. It all began in my family especially through my aunt, sculptor Felicia Leirner, who oriented me towards masters like Yolanda Mohalyi and Catalan artist Juan Ponç, who lived for many years in Brazil. After studying mineralogy, I enrolled at Emerson College in East Sussex, England, to study Anthroposophy. When I got back, I studied art at Escola Brasil from 1972 to 1973. Escola Brasil was a paramount contribution to the development of rethinking art in São Paulo in the 1970s. It was there Wesley Duke Lee introduced me to artists Baravelli, José Resende, Carlos Fajardo and art critic Frederico Nasser, who I’m friends with to this day. What are some of the highlights in your artistic odyssey? It has been over four decades since my first exhibition in 1973 at the MASP curated by Pietro Maria Bardi. The same year professor Bardi included me in a collective show of Brazilian art he curated in Brussels. Six year later when I created a character called Pondji, illustrated in watercolor, it was published along with my poetic text in the book “Sonhos de Pondji” [Pondji’s Dreams, not published in English]. The work was awarded honorable mention at the Biennial of Illustrations Bratislava, in Slovenia, and in São Paulo the book launch happened at the Museu de Imagem e Som [Image and Sound Museum]. French critic Janine Despinette, specialized in teen literature, considered it the best book of 1980 for young readers. 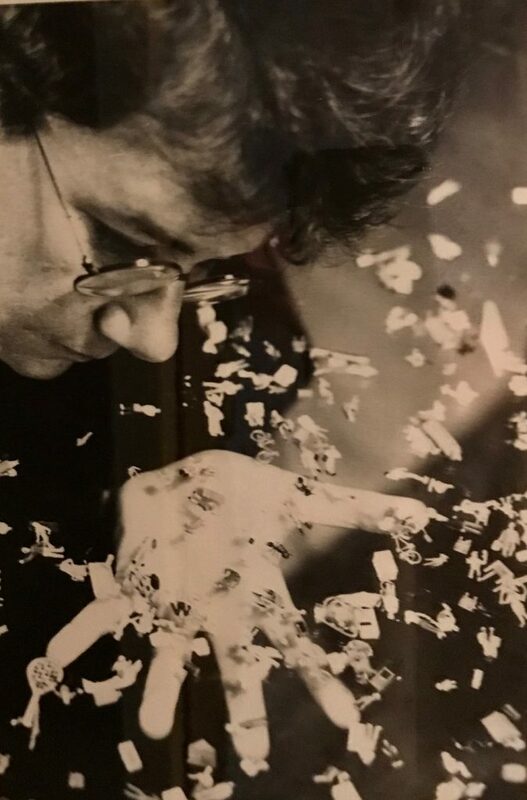 Then I went into sculpture, continued working on my illustrations and begun doing my first assemblages which were endorsed by Krajcberg, Marc Berkowitz and art critic Casimiro Xavier de Mendonça, and first exhibited in 1982 at Galeria Paulo Figueiredo. In 1997, I participated at the 6th Bienal de Havana, Cuba. All in all it has been over one hundred solos and collective shows since I became an artist. Who are the artists that have influenced your repertoire? Duchamp? Farnese de Andrade? Or do you find your influences outside the visual arts? I feel an affinity for many artists and, of course, Duchamp is one of them. I met Farnese de Andrade [1926-1996] in an exhibition in São Paulo and we became good friends until he passed away. My affinity for Amelia Toledo was via the mineral world, the stone. As for other influences, my friends are mostly from the art crowd: poets, dancers, musicians, actors, set designers, playwrights… I couldn’t live without them. To wrap up, Ricardo Resende, the show’s curator, describes you midway between a hoarder and a collector. How do you rate your compulsion? In truth, all collectors are compulsive. Hunting for antiques or vintage items and finding a beautiful, hidden gem is very gratifying. In the 1980s an antique dealer called me up to tell me a ninety-year-old lady was finally getting rid of her cherished dollhouse. I sold my VW Beetle and bought the dollhouse.